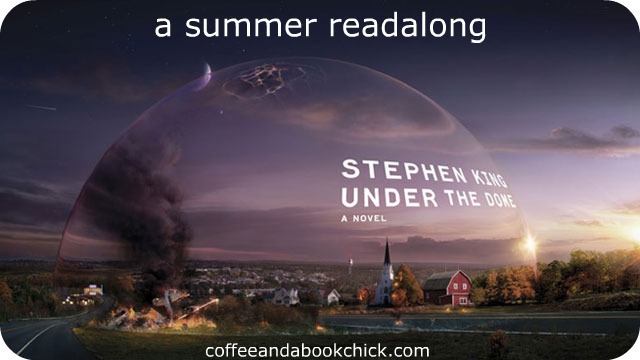 Coffee and a Book Chick: Want to Go Under the Dome? A Summer Readalong Begins May 25th. Thanks, hope you join in! OMG! I get creepy crawly feelings just thinking about returning to Stephen King! It's been years since I read any of his work ... last one was The Stand and I had to stop because it creeped me out so much ... maybe, maybe I might be up to this one, though. Okay ... let me snag a copy from where ever ... I'm in! I do agree that The Stand was pretty scary in the first section as it built up the tension and fear. However, once it got past all of that, it was more of a wildly awesome epic journey! You had to get past that first scary part, though, that's for sure! Natalie ... Unsure how you expected people to yak this book up, so I have been placing comments on my initial intro post (see link above) thinking that we could come back to each's posts (above) and talk the book back and forth ... I don't 'tweet' so that level of communication is out for me ... this was the best alternative I could think up. Call me tech challenged! I'm in. I've been looking for a good book to sink my teeth into for a while and I have a copy of this just sitting on my bookshelf waiting to be read. It must be fate! Fantastic! Don't forget to enter your name in the sign-up post! You show up in the comments as "Unknown" so not sure if there is a Blogger glitch? Can't wait to start with everyone! Sorry about that. I tried to use my Google info, but it didn't show. I don't actually have a URL to enter - no blog for me - is there something else I should enter to add my name to the list? I've already started reading and it sucked me right in, just like his books usually do. I sooooo want to join since I miss you all from the IT along but I recently read this one and really do not want to read it again. I could be strong-armed into it but once you know the ending, it's not a book to read again. I am going to watch the series though so maybe I can join in on the tweets for that. You know, just so I don't feel totally left out! Oh, I totally understand! Once you know that ending, argh, can't get it out no matter what! I'd love to have you play along whenever you want, of course! I will be watching the show after the readalong concludes, and I think we might hold the Twitter-chat then when we're all watching it at the same time? Maybe! I've been a bad blogger/reader/commenter this year, so Uncle Stevie is the only one who could pull me back into it all! I'm in (duh) but will post on Sunday and officially leave my link then. Hurrah!!!!! I'd join you if I hadn't already read it. But, the ending is fantastic, and I definitely want to read/comment on all you have to say...along with the other participants. It ended up being one of my favorite King novels, perhaps because it wasn't inherently evil. And shockingly I haven't read this book. WHA?????? yea that's right. So I am ready to dig in!!! I am about to post about it now! Hi, there, Angie! Welcome! Very excited to have you take the ride with us, especially one who runs the SK group on Goodreads! I'll stop by and join there as well. This is going to be a fun couple of months! I read this book (actually listened to the audio) 3 years ago...OMG has it been that long ago? It was LONG so I'm not going to do a re-read, and I actually can remember quite a bit about it. So I'll happily just follow along and see what you guys have to say. I will be watching the mini-series! It is one heck of a chunkster, I can't even imagine what my back will feel like when I take to on my business travel next week. Methinks I may be charged extra for carry-on baggage? Can't wait to read your thoughts as we go through this! I've missed you! I'm going to try, and hope it's not toooo scary! I have missed you as well!! I've been a horrible blogger and reader this year, so I'm so glad you're joining in and we can experience this crazy Stephen King journey! Sign up if you'd like and read if and when you can! :) Gleeful it is because I've been a horrid reader and blogger this year! I think I may have posted three times in a few months at one point. Uncle Stevie will be the only one who can bring me back into the fold, I'm certain of it! I've had this book forever and have been just pushing back on reading it as it is so long! This sounds like the perfect opportunity to give it a go! This should be fun :). I'm in!!! My first readalong every was The Historian with you Natalie :):) I loved The Stand, couldn't finish It (twice), but am ready for Under the Dome! Woohoo, Patti's in, too! Oh, I just loved The Historian readalong, and that was my very first time hosting one. Had a lot of fun with it! I need to read that book again and soon. I still say you would have liked The Stand once the scary part was done (it was pretty scary at first)!! :) BUT, I can assure you that Under the Dome starts off much less scarier and it's more just this odd, WTF is going on sort of start. Very fun, bizarre, and typical Stephen King! I hope you have fun!! Don't forget to join us on the crazy train Twitter chats at #domealong! Let's do this thing! Woot! :D I'm in and I'm excited! Woohoo! Let's get this crazy train goin'!! Welcome!! This is good peer pressure! The start of the summer months and Stephen King? The perfect way to kick it off! We are going to have fun! And don't worry about keepin' up, that's why the schedule is two full months. Just make sure you record the TV premiere so we can all watch it together after we finish the book. All aboard the crazy train!! I'm in too! I just followed you after seeing this on The Relentless Reader. I needed an excuse to start reading Under the Dome. And this is perfect. Thanks for hosting. Welcome, welcome! It will be a very fun journey! 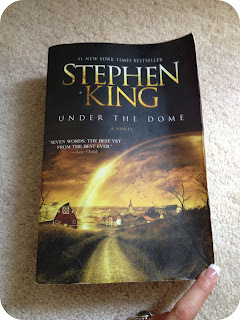 I've had Under the Dome on my TBR for quite some time so it's perfect to read with a group! Thanks for joining and have fun no matter what! I'm in!!! 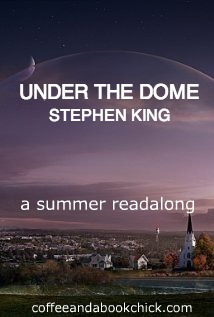 I read Under the Dome when it was first released, but I checked it out again from my library and can't wait to readalong with all of you. Wonderful! So excited you're going to join!! It's going to be one heck of a fun ride, and I cannot wait! Yay, you're on Twitter! Definitely keep updated on our #domealong chats! I started this book about a couple of years ago and then got distracted by some other books (really bad habit). This gives me an reason to finish it. The mini series looks pretty good! I CONSTANTLY get distracted by other books! Thankfully, this is the one distracting me from others right now. :) So excited to have you join and it should be fun! You all are a horrible influence! First The Stand, then The Shining, now this. I just can't resist, I'm in! Melissa, we will drag you into this, too :) Stephen King is a great way to kick off the summer! I've had this book since it first came out and even though I've wanted to read it really really bad, the page count get scaring me away. Reading it with all of you guys makes me feel better! Oh, good, I'm so excited we have so many joining! It will be a lot of fun and thank you for participating. I know what you mean about these chunkster books; they always give me pause and I end up reconsidering over and over again before I finally sit down and do it! Under the Dome is one I've had on my list for a while and I can't wait to really get into the meat of it all. We will have fun and thanks again for jumping into this all with us! Alright, you guys twisted my arm! ;) But seriously, this readalong should be a lot of fun! Great idea! Mwahahaha, more people are being pulled into the fray!! Yay! :) Thanks so much for joining, Andrea, we will have a complete blast! I so want to do this, but I have completely dropped the ball on my Harry Potter readalong so I'm going to resist. But I'll maybe perhaps try to pick this up over the summer too (I already have it on my Nook!) and if I do keep up, I'll try to post! No worries! I know what it's like to participate in more than one readalong at a time and sometimes, it becomes more stressful than fun. Join if you can, read if you want, join us on Twitter, and have fun! Stephen King has become my new favorite way to celebrate the start of the summer months! It is never too late to join! Please do and enter your name on the Linky when you're ready! I'll update the participants' list and we will have fun! Under The Dome is one of the few books by Stephen King that I haven't read, even though I have a copy. Please count me in! Sorry, this is the name and URL I want to participate with. Thanks! Hi, Amritorupa! Thanks for joining and I will update the participants' list with Rivers I Have Known as the site to reference for your updates! If you're on Twitter, do join us there for our chats at #DomeAlong. Looking forward to your thoughts on the book; Stephen King has become my favorite way to kick off the summer! It's official now. Published my sign up post. Not sure when I'll actually start though. I have to finish my current book first. I was lucky to stumble upon this last night! I'm so excited to be a part of this! I've been meaning to read this for a long time. :D Thanks for hosting! Yay! I've had it on my kindle since December and have been waiting for this readalong. I'm too lazy of a blogger right now to do an initial post, but I'll try to get one up partway through. I can't wait! Thanks for putting this together. I have been wanting to read this for such a long time so this will hopefully be the motivation I need!! Been a Stephen King fan for far too many years than I care to admit to. Definitely going to do the read-along! Can't wait to see what everyone thinks. I am starting a little late but hoping I can get it read before the start of the show. Okay ... the book came in the mail from a friend and I've jumped right in ... immediate reaction? Big Jim Rennie is one scary megalomaniac and his son is even creepier! I am an SK constant reader and I have had this book on my kindle since I preordered it in 2009... that long! I am going to get this read finally! Hi Natalie, Can you please tell me when everyone is posting their review? Are we all waiting till the end of July? I just signed up. :) Already 200 pages in (started last night), and I'm already hooked! I am SOO glad I jumped on board with this. I am loving this book. Such an addictive read and I am having a ball trying to figure out all his easter eggs and pop-culture references. Extra fun with all the #DomeAlong tweets. I am coming in incredibly late, but looking forward to the challenge. Thank you for hosting.